In a collaborative effort, artists Dominic Lippillo and Mark Schoon have created two photographic series, Anti-local and Conflation, that work at defining place. These series as well as solo works by each artist open into an expanded dialogue about the home, domesticity, place and space. The images chronicle a 5-year working relationship between the artists with pieces ranging from intimate diptych pairings to larger scale studies of rooms. About the artists – Dominic Lippillo and Mark Schoon earned their MFAs in Photography from Ohio University in 2009. Working independently with lens-based media they soon realized they had a shared interest in the domestic. Although they approach their solo work differently, Schoon as an observer and Lippillo as a witness, a common sensibility could be recognized in the work of both artists, leading to the creation of their collaborative effort. Selections from their collaborations have been published in Lens Scratch, Exposure, and Culture Map and are included in the permanent collection of The Museum of Fine Arts, Houston; and the Museum of Photographic Arts in San Diego, CA. Their work has been shown nationally and internationally. Lippillo is an Assistant Professor of Art at Mississippi State University. Schoon is an Assistant Professor of Art at The University of West Georgia. 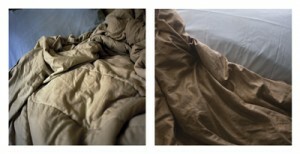 Lippillo/Shoon, “Untitled (beds),” diptych photograph, courtesy the artists. For more information, contact Rachel Dobson: rachel.dobson@ua.edu.